I "Mattutini" sono stati dei biscotti lanciati da mulino bianco a metà degli anni '90. Anni in cui, nella mia adolescenza, imperversavano nelle radio le canzoni dei Take That. Tutti vestivamo con gli scarponi da militare sotto ai jeans, e usavamo quelle camicie felpate a quadrettoni sotto i pullower di lana con collo alto. Per non parlare dei tagli di capelli, che prevedevano dei ciuffi alti sopra fronte, tenuti fissati da tantissima lacca e gel. E sopratutto, rimanevamo letteralmente incollati alla tv per non perdere nemmeno una puntata di Beverly Hills. Ebbene, in quegli anni, le miei mattine non potevano iniziare, se accanto il mio latte non c'era una confezione di Mattuttini. Tanto che, il mio amore per questi biscotti, mi portò a rifarli in cucina, o meglio, a combinare solo dei disastri, seguiti dalle urla di mia madre al mio seguito...Forse, non riuscendo ad arrendermi, che a quel tempo fosse veramente difficile rifarli senza una ricetta guida, ritagliai la confezione e la conservai sulla mia agenda personale delle ricette. I mattutini, però nel tempo, non furono più prodotti da mulino bianco, i Take That sciolsero il loro gruppo e Beverly Hills mandò, in onda la sua ultima puntata. Fino a quando qualcosa ha riportato ai nostri giorni, questi miti degli anni novanta, eccetto i mattuttini, i quali però a sorpresa poco tempo fa, ritrovando ancora quell'incarto della confezione nella mia vecchia agenda, ho deciso di rifarli. Stavolta, però con l'esperienza acquisita negli anni in cucina, la ricetta è andata a buon fine. 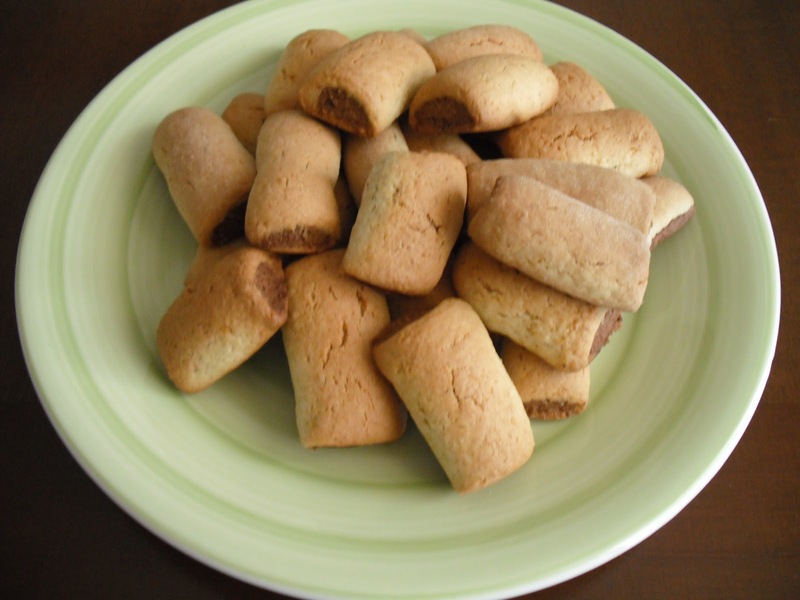 Oggi, per tutti i nostalgici degli anni novanta e per chi vuole riscoprire questi gustosi biscotti, vi presento la mia inedita ricetta. Impastare tutti gli ingredienti. Dividere l'impasto in due parti uguali. A una parte di impasto aggiungere il cacao. Lasciare riposare gli impasti in frigorifero per 30 - 40 minuti. Fare dei cordoni lunghi sia con la pasta chiara, sia con quella scura al cacao. I cordoni di pasta chiara, devo avere lo spessore di circa un centimetro di diametro, mentre quelli al cacao leggermente più piccoli. Stendere sottili i cordoni di pasta chiara. Appoggiare sopra i cordoni di pasta al cacao e rotolare la pasta chiara su quella al cacao, in modo che la pasta scura sia completamente coperta e si trovi chiusa all'interno della pasta chiara. Tagliare dei cilindri di 4,5 - 5 centimetri di lunghezza. Appoggiare su una teglia con carta da forno e cuocere a forno caldo 180° gradi per 15 - 20 minuti. Una volta esaurito tutto l'impasto e finito di cuocere tutti i biscotti, Rimettere tutti i biscotti nel forno spento ma ancora caldo, chiudere lo sportello e lasciare che cuocere fino a quando il forno si sarà raffreddato. Questo per seccare l'interno della pasta al cacao, che se non fatto seccare in forno rimarrebbe morbido e non cotto perfettamente. Nuxia's recipes - "Back ... to the Future!" Nuxia has some recipes created by her, at the beginning in the kitchen that have made a difference in her teenage years. All this is topped by a short personal story that introduces the recipe. The salad rock - pop is a dish invented by me only 15 years. He was the first savory dish that I created on my own. For dessert, I had already started instead of twelve. Taking advantage of the absence of my mother opened the pantry and voila, this dish was born. My mother, a former sous chef by profession who left his career to devote himself to his family, was surprised and at the same time assailed by remorse, not letting me go to school for cooks and hoteliers (me confessed shortly thereafter). Tasting it he said: << To you, a teenager who delights in the kitchen, this salad is really something amazing on the palate. Did you make it? >> unbelief, struggled to disappear from his face when I answered shyly << Yes >> But it was the truth. His daughter had invented just for fun, salad that soon, it would have received the consent of the rest of the family. For some time, I prepared very often with my mother, each time followed carefully all the preparation, without ever take part. Luckily for me, I wrote the recipe in my agenda kitchen (at that age, I had already created one, very personal.) But then ended in oblivion. Until not long ago, "Dust Off" I found myself reading the recipe for this salad, which, however, I have never given a name. So I decided to take it to you, with the following title: "Salad Rock - Pop." I chose it because the Rock and Pop are two distinct musical engineers that accompanied my adolescence., But not only. In fact, the title hides a very special reason much more important and curious. My salad Rock - Pop was always prepared with two different types of accompanying sauce, to meet the needs of all the palates of my family. The first version of this recipe calls for serving it cold with mayonnaise. The second version, instead of serving lukewarm with an emulsion of oil and lemon. So, you get a salad taste and intense, in the first case that I call "Rock". While in the second case, you get a salad much more sweet and delicate aroma intended for, released by the onion of Tropea. 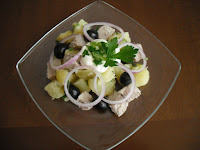 But the thing that makes me really proud of my culinary invention, is that all the ingredients used in the preparation of the recipe, are typical of the earth Calabrese. Above all, they come from the "Coast of Idei", the strip of land which overlooks the beautiful town of Tropea. Peel the potatoes and cut into cubes. Put in a runny paste and pass under a jet of cold water to remove excess starch. Drain. and cook on the stove, in a pot with boiling water. Steam or grill the tuna steaks. If you want to cook light and do not have the steamer, you can cook the slices in a pan with a little water and lid closed for a few minutes. Once cooked leave to cool. Then cut into large cubes. Once cooked potatoes (must be boiled. Enter a fork to check a potato. Flaps must sink in without potato, the potato break.) Drain and pass again under running cold water. Drain and place in a salad bowl. Peel the Tropea's ** onion and cut in circles. Into salad bowl insert the diced tuna, whole olives, and chopped parsley. Stir and add the onion rings. Season with salt if necessary. If you want the cold version add the mayonnaise and leave in the refrigerator at least one hour before serving. If you want the lukewarm version, emulsify oil and lemon juice. Add the salad and serve. ** If you have digestion problems with the onion, proceed as follows: Cut the onion into rings and place them in a bowl of cold water with ice cubes. Leave the onion in water for half an hour. Then mix. Drain the onion and pass under a jet of cold water before adding it to the rest of the ingredients. In the absence of fresh or frozen tuna, fresh tuna you can replace with the one in the box. it will take 2 or 3 boxes of 80g. If you want to mix it with the mayonnaise to use natural, but do not add more salt in the salad. If you want to dress with the emulsion, you can also use the olive oil by reducing the amount of oil to emulsify. If you want to eat the salad cold, you can store it in the refrigerator without mayonnaise, and serve with the sauce just before serving. province of Vibo Valentia and Catanzaro, province of Caserta in Campania. to be served raw in salads, or as an ingredient in dishes more or less elaborate, does not require any pairing wine. Tropea Red Onion owes its fame to the sweet taste that sets it apart and is particularly appreciated for its fleshy pulp and crispy. Its characteristics are determined by the particular composition of the culture medium, typically sandy, in addition to the mild climate of the region. There are various types of onion of Tropea, differing in shape - flat or elongated - as well as ripening: the early harvest is between April and May, the medium-early in May and June, and the late variety in the months of June and July . 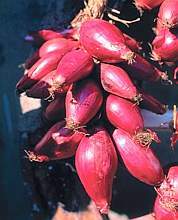 The Onion of Tropea can be medium size or medium-large, the color red can be more or less intense. The inner leaves are reddish white, and the bulb has a round shape or top. The flavor is sweet and slightly pungent. The Onion of Tropea is sold in several ways: the onion (colored rosé) is sold in bunches, the onion consumption, rose-colored and larger than those of the onion, is sold fresh, and finally the Serbian onion, purplish and sometimes sold in pigtails, has dried bulbs. 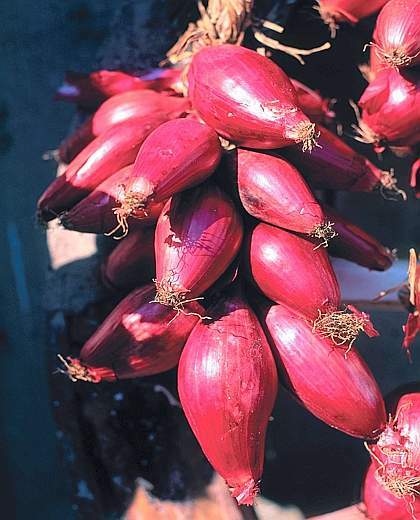 The Red Onion Tropea is excellent in salads, pickled, as an ingredient in omelettes and tarts onions, jams, and can be used to prepare sauces and fried as well as to flavor many dishes. * Note: This article is the property of the newspaper Corriere della Sera (cucina.corriere.it) is reported on this site, only with a view to raise awareness of Italian products in the world. There is no correlation between this site / blog ee the above mentioned.